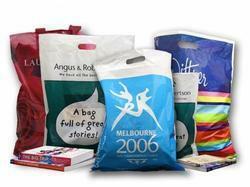 We are engaged in offering an excellent range of Printed Poly Bag for Packaging. Ideally used for shopping purposes, this range is precisely manufactured using the deluxe quality HM granules at par with global standards of quality. Our whole range is made available in a wide assortment of sizes and shapes as per the constraint of our prestigious clients. The offered bags are extensively used in various departmental stores and shopping malls for carrying shoes, clothes and food items. Printed Poly bags are attractive and light weighted. Looking for Printed Poly Bag for Packaging ?